The FAA recently expanded its online drone registration system to include unmanned aircraft systems (UAS, or "drones") being used for commercial or public uses. Previously, online registration was only available for drones being used for hobby or recreational purposes, but no matter the purpose or activity, all drone owners are required to register every drone they have. The registration process only takes five to ten minutes. The cost is $5.00 and each drone registration is valid for three years. Here's the official website to register your drone: FAA.gov/UAS/Registration. Remember: only hobby and recreational uses are currently permitted unless the drone operator is a licensed pilot and has a Section 333 exemption from the FAA but stay tuned for new regulations that should be made public within the next few months. PPA wants to be very clear that the registration expansion does not mean that regulations have changed (though it is a good sign that the changes are coming very soon). 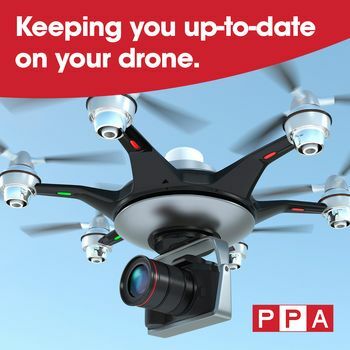 Registering a drone for business-related use is very similar to the hobbyist registration and is outlined in this article PPA published previously. There is just one additional step required and that is for you to provide the manufacturer, model, and serial number of your drone. The system will also prompt you to input information about your organization (your business) into your account profile. Once you have registered your drone, you will be assigned a registration number. Be sure to follow the FAA's instructions for labeling your drone properly once you have that unique registration number. You must have your FAA registration certificate in your possession when operating any unmanned aircraft. That proof of registration may be either on paper or electronic, but it must be available immediately upon request. And remember: Commercial drone use is still heavily regulated, requiring an exemption from the FAA and a pilot's license to be fully legal; however, we expect those requirements to be loosened soon. The FAA making commercial registration available online bodes well for the new regulations appearing just around the corner. We'll keep you posted on any and all updates here and on PPA.com/Drones.